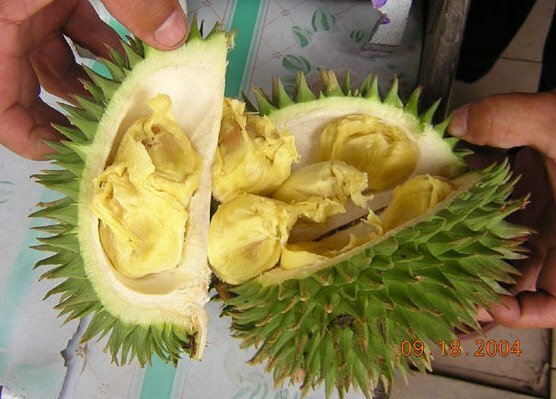 Durian isu is a type of durian. It occurs Borneo; Peninsular Malaysia, Sumatra etc. in South East Asia. This fruit seems to have been originated in this region only. Duria isu can be seen growing wild mostly in the lowland raiforests. 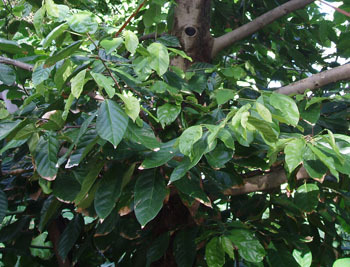 It is often cultivated in Borneo. Leaves alternate, simple, Penni-veined, lower surface whitish, with hairs INSTEAD OF scales. Flowers white-yellow, 15 mm wide, borne in cymes on twigs behind the leaves, epicalyx 2-3-lobed . Fruits grayish green or yellow, 15 cm long, long spines on rind; pulp yellow to orange, very sweet, lobes 4. The fruits are edible and are eaten by local people. These are sometimes also sold in local markets, mostly to foreigners. 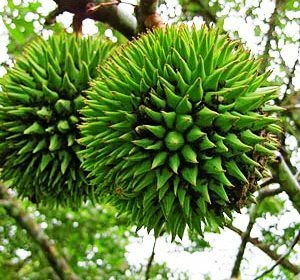 Duria isu is cultivated only in Borneo. Elsewhere the fruits are collected from wild only. Observation indicates that this may bo best in humid area. It will grow best on clay rich alluvial soils that are frequently flooded and remains most.